This spread of hashtags corresponds to the first phase of the use of social media in emergency situation, called the Information Phase. In this first phase (out 6 in total, you can read more on Nicolas Vanderbiest website), users of social network are trying to detect and identify hashtags big enough (meaning used by enough reliable sources) to follow the stream of tweets linked to the events. Moments after the second blas in the subway, social media jumped into the Organization phase, using social media to find out if relatives are affected by the attacks and organizing researches. Launched in the aftermath of the earthquake in Nepal, Facebook Safety Check is a tool allowing people living or localized around a disaster to confirm they’re safe. 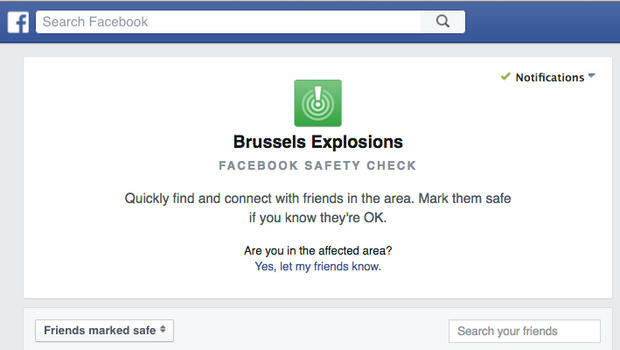 The tool also allows you to mark safe people you know they’re OK.
Why should you use the Facebook Safety Check ? By marking you safe on the tool after a disaster, you spare dozens of calls from your relatives to emergency services. These non-made calls clear the way for very urgent calls between emergency services themselves. It is equivalent to leave free on a highway shoulder to help emergency vehicles to reach the accident zone. Of course, if the Safety Check is not enabled, you can always publish an update on your social media accounts. But we’ll see why you should be careful. Why was the Safety Check activated 3 hours after the 1st blasts ? A bunch of negative comments burst out about the activation timing. Some argued that 3 hours agter the first blasts was too long and asked for the tool to be available sooner. Let’s look into this: one of the reasons Facebook took time to deploy the Safety Check was the fear that attacks may not yet be over. It is indeed very dangerous to help people marking themselves safe if their environment is not safe. During the Organization phase, these hashtags are tools to gather good will and collaboration with people hurted, injured or affected in any way by the blasts. These hashtags provided all kinds of solutions, from offering a coffee to helping people to go back home. In close collaboration with Sylvain Lapoix, french journalist who launched #PorteOuverte during the Paris Attacks, and the support of EENA, the european emergency number Association, aka the 112 (the european 911), we launched #OpenHouse and reactivated #PorteOuverte to allow the inhabitants of Brussels to offer a safe accomodation to people stuck in Brussels: relatives to injured people, travelers stuck because of the airport and train station shutdown for instance. These 2 hashtags were soon joined by #IlWilHelpen (« I want to help » in Dutch) used by the flemish community from Belgium or #BrusselsLift, gathering free car-pooling offers to workers unable to go back home. Follow #brusselslift #PorteOuverte #OpenHouse #ikwilhelpen and #jeveuxaider if you need lift or shelter. Regarding #Openhouse : more than 3000 tweets have been sent in the 24 hours following the attacks. We counted more than 80 houses opened. 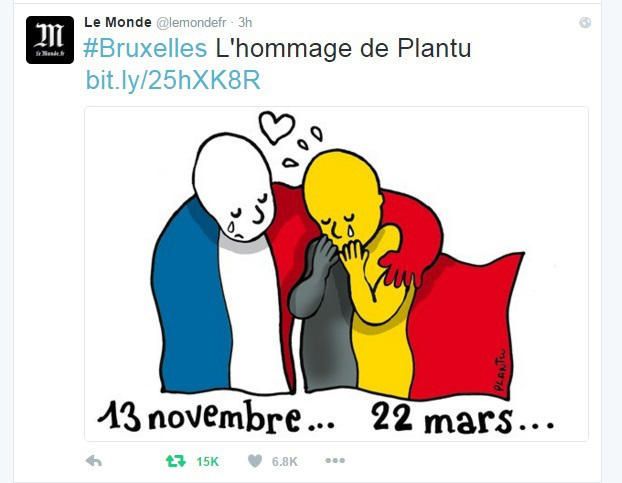 Reactions were very positive, showing the solidarity for Brussels inhabitants. It was also very interesting to notice that these hashtags were sometimes hijacked : many parisians used them also to offer accomodation in Paris for people who could not go back to Brussels after the shutdowns. ← #BrusselsAttacks #OpenHouse : quel rôle des médias sociaux ?